Amazing. Sublime. Transcendent. Damn good! The third iteration of the Greenfresh Market Renton Red is one of those rare and wonderful discoveries that simply baffles explanation and recharges my excitement for finding great $10.00 wines. I've tasted hundreds of wines under $10.00 and more than 100 wines priced between $30 and $100 per bottle. There really is a pretty major difference in quality. Not all expensive wines are excellent, but almost all excellent wines are over $30.00. Don't get me wrong, there are very good wines under $10.00 and that's what my blog is all about. But it is rare that I find a $10.00 wine that stands up to the best wines in the world. 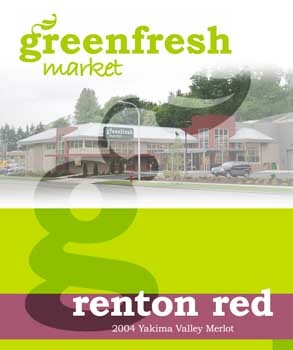 Welcome the 2005 Greenfresh Market Renton Red. First a disclaimer: I am an investor in Greenfresh Market and the Renton Red is sold exclusively at Greenfresh Market, so I do benefit indirectly from the success of this wine. Yet, I did not feel the need to write up the 2003 and 2004 Renton Reds. It was not until the 2005 version that I fell for this wine. For those of you who shop at Greenfresh Market, look for the 2005 Renton Red in the coming weeks and I strongly encourage you to buy it by the case! I certainly will.